Here’s release note of version 3.3.0 including TV Friends iPhone version. 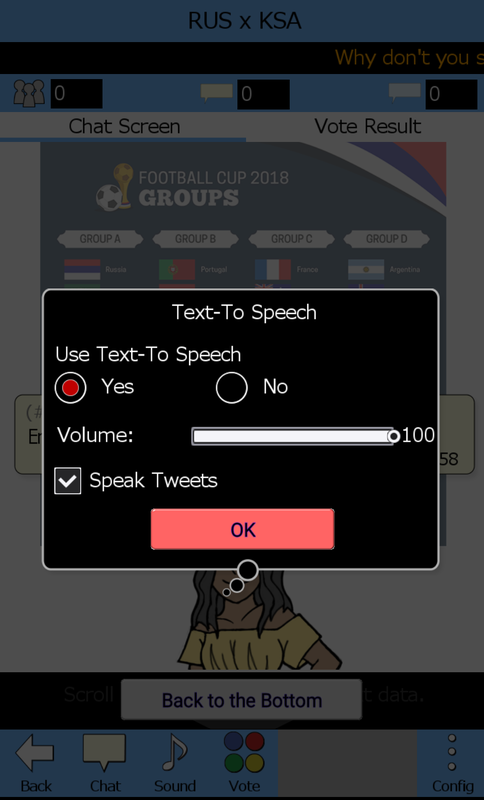 Text-To Speech (TTS) function is added. Now you can “listen” to comments without watching a device screen. Chat comments, Twitter comments, and Voting will be speeched (user names for votes won’t be speeched). 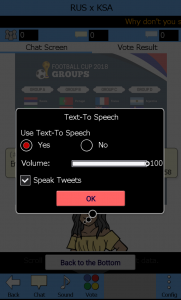 While speaking comments, the next coment won’t be displayed.On Android, TV Friends uses a voice (language) and speech speed which is set in “Settings > Language & input > Text-to-speech output.” Menu names might be slightly different OS’s version by version.On iOS, OS’s language and the language’s default voice will be used in normal speech speed. Please be noted that a voice in “Settings > Accessibility > Speech” is not used in TV Friends. Please refer help to know how to set TTS. The following four sound effects are added. [iOS] Apple Inc. did not permit 16:9 screen mode on iPad, so full screen mode is applied again to iOS. Because of this change, Title screen’s layout is adjusted. The problem you will be asked to authorize Twitter again and again everytime you enter a chat room if you cancel Twitter authentication, is fixed. The problem a long Twitter user name isn’t fit in a chat dialog is fixed. The problem that users cannot authorize Twitter after 2018/06/12 because of Twitter’s security poricy change is fixed. [iOS] On iPhone, the problem that an Ad will be overrapped to fotter buttons right after Twitter authentication is fixed. [iOS] The problem that text size while inputting was too small is fixed.